Nothing is more American than a good old fashioned potluck meal. Other than worrying about over-eating at these things, sometimes the biggest problem with a potluck is deciding on what to bring. You can check that problem off right here and now with this easy Beef Taco Salad, a classic potluck salad. This Beef Taco Salad is a fast and easy crowd-pleaser. 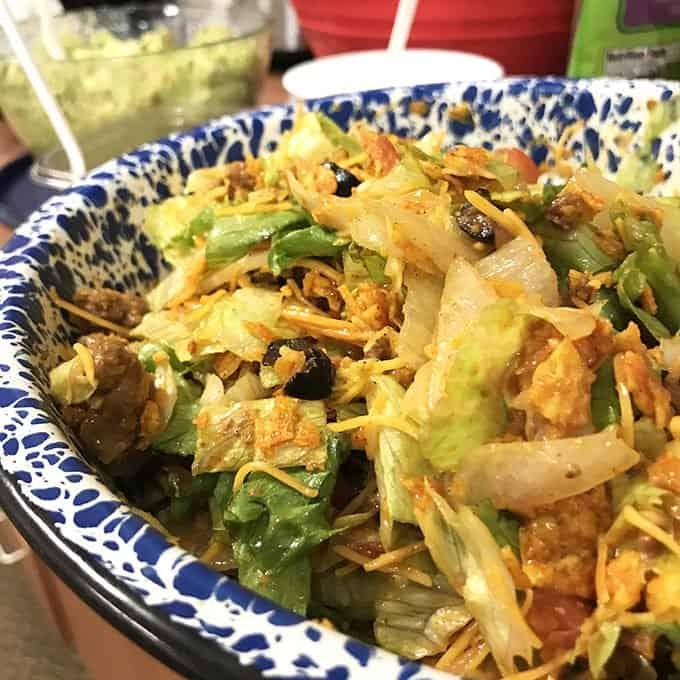 I’m sharing this Taco salad with Doritos and western dressing with you because it was one of my favorite things at today’s potluck dinner at work. The potluck was given a taco theme and this Doritos taco salad was a perfect hit. This beef taco salad makes for a great potluck idea for work. 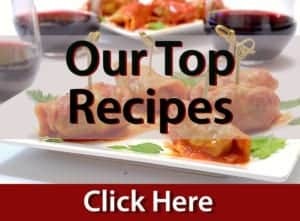 Often times, you find the best recipes for potluck food right at work. I’m not sure I’ve ever seen a display of slow cookers like the one in my work lounge today. 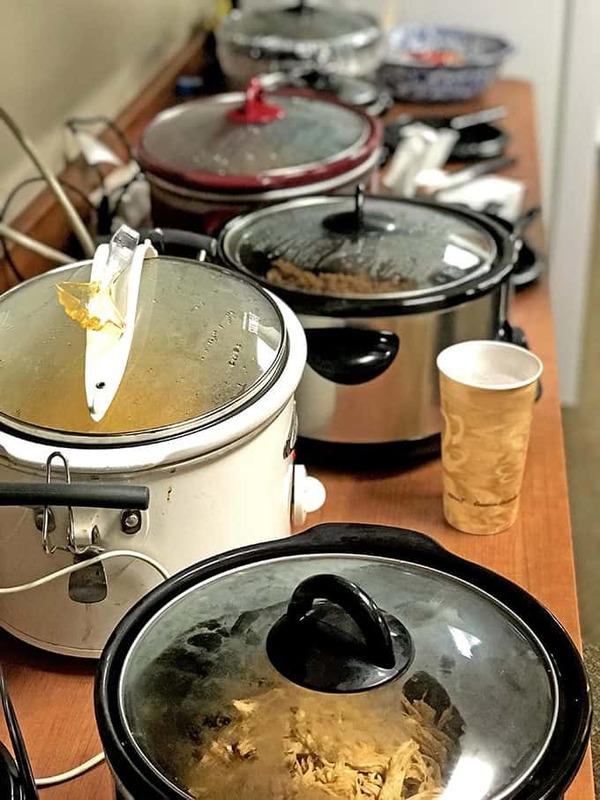 Although our department only has a dozen or so people, we always have enough to feed double that number and today was no exception. My contribution was the mozzarella meatballs recipe that we shared with you a few days ago and although it didn’t exactly fit with the taco theme, there were plenty of Tex-mex recipes that did, including this beauty of a pot lucksalad. 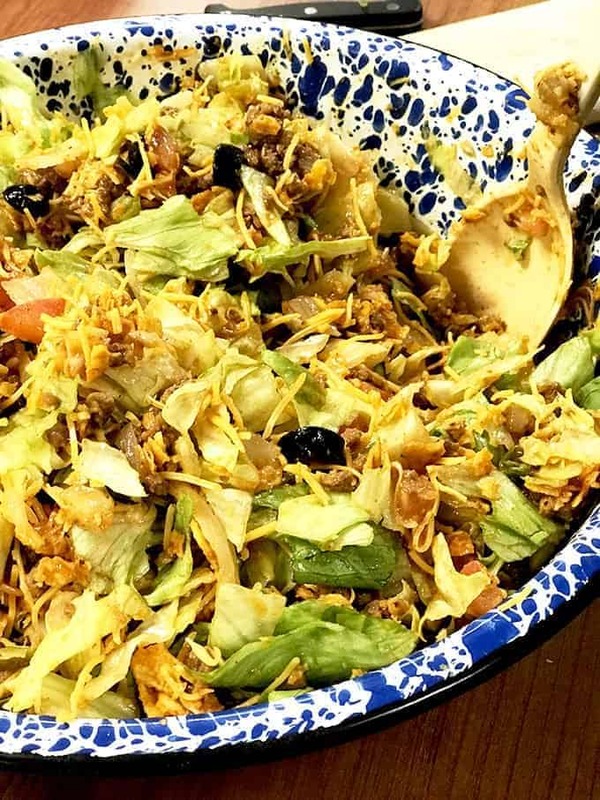 Beef taco salad makes for the perfect potluck salad idea. The girl was not kidding. I’m happy to pass this American classic on to you today, I think you’re going to enjoy it. 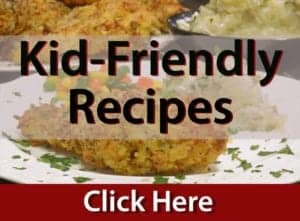 It’s super easy to make and is great to feed a crowd. 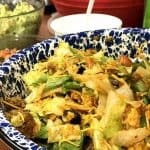 Try this Dorito taco salad, it’s one of the best potluck salads you can make. Give this Dorito taco salad a try at your next potluck, you’ll be glad you did! This Taco salad with Doritos and western dressing is also known as beef taco salad and is a fast and easy crowd-pleaser, makimg it the perfect potluck salad. Brown ground beef with onion, drain and set aside. Then add taco seasoning and 1/2 the amount of water called for on the packet. Mix well. Chop lettuce into bite size pieces. Add beef mixture, tomatoes, black olives and cheese and mix well. Just before serving, add Western dressing and crushed Doritos, mix well and serve. Pin this Taco Salad with Doritos and Western Dressing for later! This looks like the perfect taco salad! I need to try it! 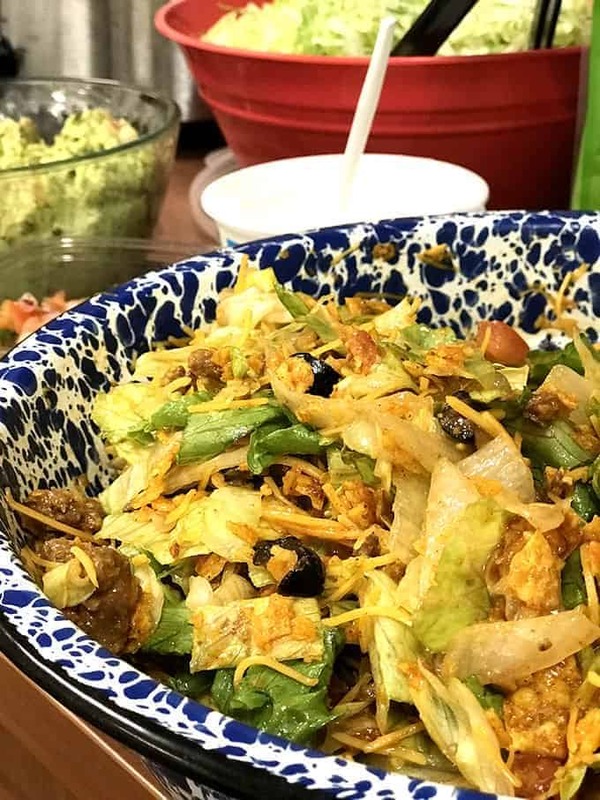 Taco salad is one of our favorite meals, especially during the summer months when we are out and about more. This comes together quickly and it’s super satisfying. Thanks for a delicious recipe! I cant wait to try this! I just saw western dressing at the market and picked it up to give this a try! 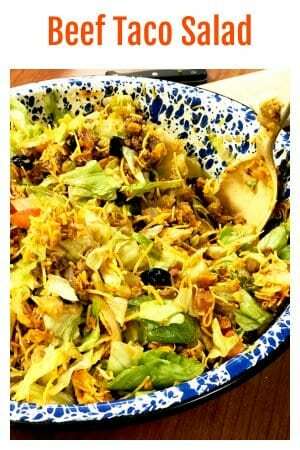 I wouldn’t invite anyone to my potluck that didn’t like tacos so this salad will always have center stage at mine! What a great way to make a salad totally customizable and still perfect for hot summer days! We love making a meal out of a salad in the summertime. This one didn’t disappoint! Thanks! Thanks for the great feedback; enjoy your summer! This is perfect! I am always looking for new weeknight dinners that are easy to throw together, full of flavor and one that my whole family will enjoy! This Beef Taco Salad sounds like a winner to me! Cant wait to make it this week! Thanks! Thanks for the feedback, Angela. This salad is always a winner! This is exactly how I remember this salad as a kid when my mom would make it for our family reunions each summer. Thank you!!! Thanks for the feedback Megham! I love how food can bring back memories like this salad does for you.